To search our FAQ please use your browsers search function. If you can't find an answer please ask us using our contact form. Don't forget to add information about the device, the serial number, the Windows version and the settings in ClewareControl. Screen shots are welcome to see what your settings are. Can I control the Cleware products via the registry? "Service Manger Fehler 5" shows up. What to do? Is is possible to start programs when a specific value is reached? Is the Cleware Service compatible with 64 bit versions of Windows Server? Cleware Service installation with Vista®/Windows7®/Windows Server®? Do I need special hardware to send SMS? How can I use LabView with Cleware-Devices?? How to send measured values to other PCs? How does the US-Temp measure the temperature? Could the USB-Temp handle multiple temperature controlled actions? Is the USB-Temp useful for outdoor measuring? Is the USB-Temp water proofed? Record values in simple text files? Are API functions be the same for switches with single or multiple switches? How could I control USB-Switch 3/4 switches? To start the service just change the start settings in ClewareControl. Before doing this you should have installed and tested all action settings. ClewareControl runs with all Microsoft Windows® systems starting with Windows®2000, including Windows 7®, Server2003® and Server2008® (® Microsoft Windows is a registered trademark of the Microsoft Corporation). 32bit and 64bit are supported. While it should be easily possible to use our devices with Apples OS, we have not done so until now. If somebody want to do the port, we will support this. Yes. Here is an example program to control a USB-Ampel used by the registry. To do this, copy the subroutine SetSwitch (int SwitchID, int turn switch) in the desired program. The SwitchID refers to the individual lights or buzzer, starting from 0 Turn switch is 0 for off and 1 to turn on. So that you can start testing on your XP system (For the operating system Windows 7 and Windows 8 start Cleware Control as the administrator !) Best ClewareControl. In ClewareControl then select " ClewareControl start as a service." If this happens without an error message, you can end ClewareControl. You do not need it of this PC any more, because ClewareControl now always moves along at system startup as a service. In order to test the Switch via the registry, use the registry program traffic lights. Please copy this in a directory of your choice, then open a command window, type in this directory and set with a simple call to the Registry. The connected traffic lights should respond verzögerngsfrei. When importing the USBaccess.dll you may easily access all Cleware devices. The newest version of the USBaccess.dll allows very easy access to temperature and humidity as well. Start ClewareControl as Administrator (right mouse button) before ticking the Cleware Service in the start options. The error message "Service Manager Error 5" indicates that ClewareControl does not have enough privileges to do the requested operation. To solve this, start ClewareControl by using the right mouse button and choose "startas Administrator". If removel of the ClewareService fails, please open a command line window (Windows 7 + Server - please open as adminitrator) and start the command "sc delete ClewareService". After restarting Windows, the service should be vanished. The email password is needed to initiate the sending of the email. No special SMS hardware is neede. The SMS is generated by sending an email with defined contents to an SMS gateway. Here the email is converted to an SMS message. How can I use cleware devices with LabView? There are two ways to control the devices with LabVIew. The first one is to send a command (USBswitchCMD) with appropriate arguments. This will turn the device. 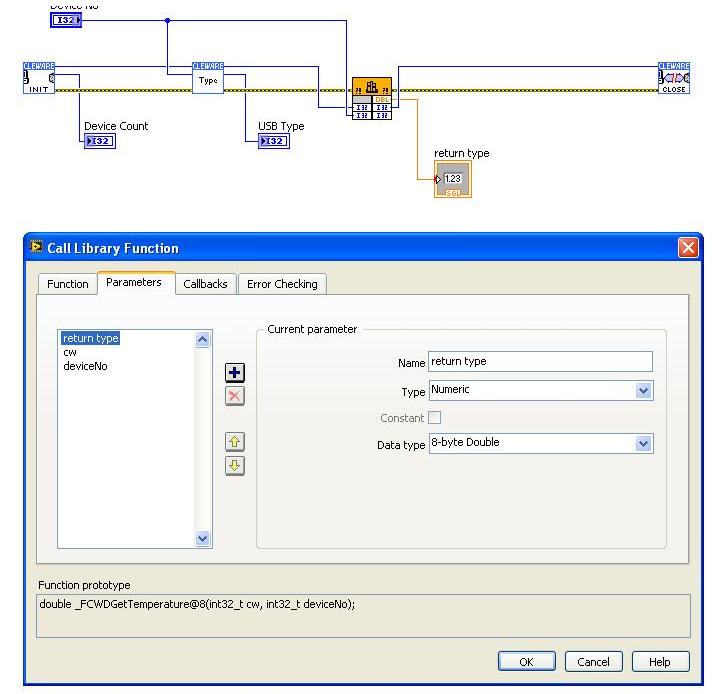 It is also possible to attach our interface USBaccess.dll directly in LABVIEW. We have a couple of customers going this way. Here is a little picture from our customer showing how to integrate the USB-Temp. The USB-Switches follow the same rules. If the devices will be moved to another server, it would be nice to move the defined actions also to the new PC. This could be done by exporting the USB item in the Registry "HKEY_LOCAL_MASCHINE/Software/Cleware GmbH". This item should be imported at the same place at the new PC while ClewareControl (and ClewareService) ar not running. After importing the registry and starting ClewareControl, you should see the new items. The sensors have no storage for measured values. But the USB-IO16 will remember the input/output settings of the IO channels. To send measured values from one PC to another, all PCs must have installed ClewareControl. One of these PCs is the display server, which is defined by set the corresponding ClewareControl option. The others are set to clients in the options. Here is also the place to define the target of the values, the name of the display server..
How does the USB-Temp measurement work? The sensor inside the USB-Temp is thermal glued to the housing. This makes the sensor very sensible to temperature changes especially, if it is mounted to the point of interest, e.g. heating pipe. The accuracy is +/- 1° C. If more accurate measuring is needed, please refer to the USB-Humidity, which meases temperature together with humidity. Yes, up to 256 actions could be controlled in parallel. JYes, the USB-Temp is very robust. The only point is the USB cable, which should not be cutted. And when using with low temperatures the USB cable must not be moved. The USB-Temp is protected against spash water (IP57) and it could be used under water for some days. To generate simple text file containing the measered values, please use USBtemp with the option -o <filename>, e.g. It is possible to use the USB-Humidity outdoor, because the electronic is sealed splash proofed. But if the sensor is covered with water, you must wait until it is dry before useful humidity values are available. The temperature is accurate, anyway. How to set traffic lights using command line tool ? The tool to configure the USB-FootSwitch is ready for download in the download area. It comes with some documentation how to use. USBswitchCMD could be used to easy turn switches on and off. The functions are the same. The sub switch is defined in the secaond argument. To select the switch using USBswitchCMD use the option -# x, with x defines the switch, starting with 0 for the first one. To turn the second switch on, please call USBswitchCMD -# 1 1.